Everyone goes crazy for bacon! 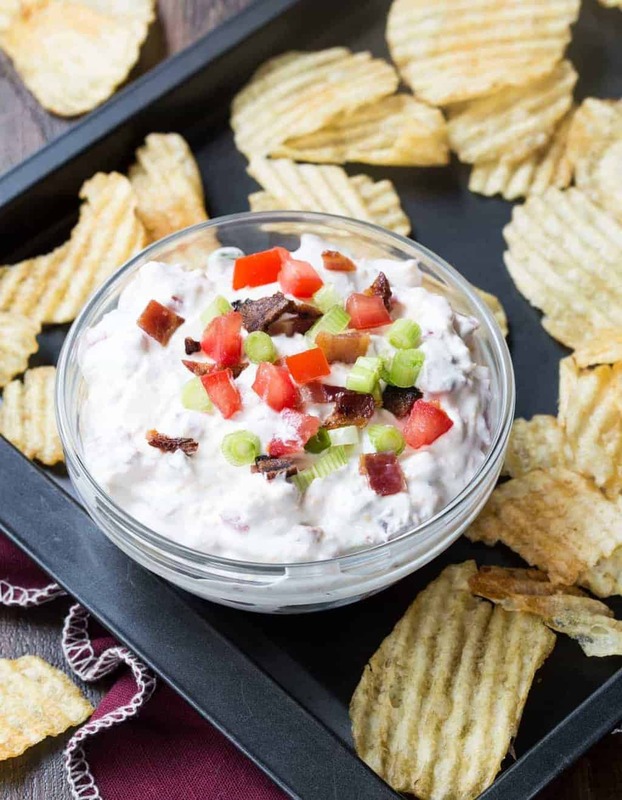 This Tomato Bacon Dip is THE appetizer that needs to be added to your gathering. Trust me on this one. Tomato. Bacon. Cheese. Goodness. If you are a long time Garnish with Lemon reader, you know that appetizers and easy entertaining are near and dear to our hearts. We’re always on the hunt for appetizers that are simple, delicious and will easily feed a group. It’s an added bonus if we can make them ahead of time. And when we find a keeper, we have to share it with you. This Tomato Bacon Dip is all of those things and more. 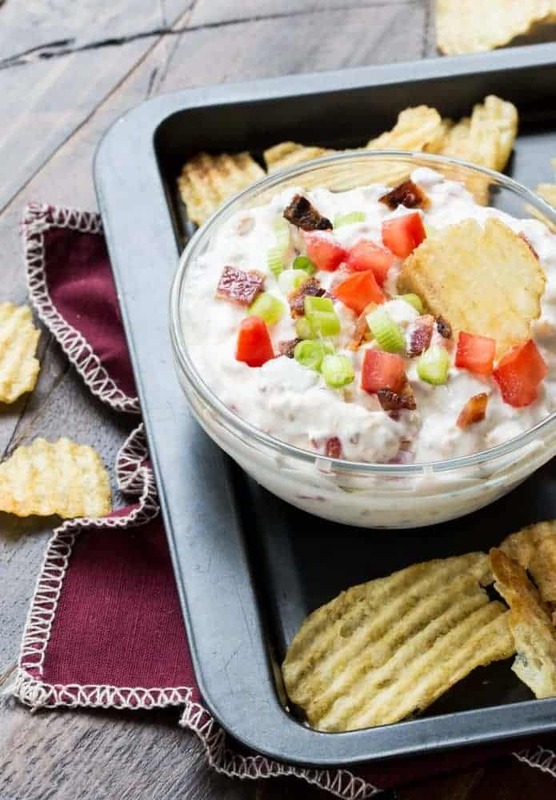 Tomato Bacon Dip is like a BLT in a big bowl but without the lettuce, because soggy lettuce just isn’t appealing to anyone. So instead of lettuce, we added cheese because cheese and bacon is a solid win for everyone. Aaaannnd it doesn’t hurt when you throw in some chopped green onions and garlic powder. Scoop it up with a big crunchy chip or some fresh veggies, and you are on your way to appetizer heaven. The hardest thing about this dip? Waiting for it to chill. This Tomato Bacon Dip tastes best if you let the flavors hang out for awhile in the fridge. Once you taste the perfect combination of the salty bacon and garlic flavors, you’ll know the wait was worth it. Keep it easy and serve this dip with potato chips, or get fancy and hollow out a pumpernickel loaf and fill it with dip. Add some sliced veggies and pumpernickel bites for dippers, and you have achieved party food perfection. Tip: Keep your stove top clean. Place bacon on a jelly roll pan lined with aluminum foil. Bake in the oven at 350 degrees for 20 minutes or until crisp! Place sour cream, Greek yogurt and cream cheese in a medium bowl and mix until smooth. Add garlic powder and black pepper and stir to combine. Add green onions, crumbled bacon, diced tomato and shredded cheddar. Stir gently to until just combined. Transfer dip to container with a lid and refrigerate for 4 hours or overnight. Reserve a tablespoon each of green onions, bacon and tomato for garnish if desired. Can you ever have too many dip recipes?